Kaleck’s work has taken him to Buenos Aires, to stand with the mothers of youngsters “disappeared” under the Argentinian military dictatorship; to exiled Syrian communities, where he assembled the case against torture mandated by those high up in the Assad government; to Central America, where he collaborated with those pursuing the Guatemalan military for its massacres of indigenous people; to New York, to partner with the Center for Constitutional Rights in taking action against Donald Rumsfeld for the “enhanced interrogation techniques” he greenlighted after 9/11; and to Moscow, where he represents the whistle-blower Edward Snowden, “a likeable man whose talents go far beyond his technical skills.” In recounting his involvement in such cases, Kaleck gives voice to those he is representing, emphasizing the courage and persistence they bring to the global search for justice. The Berlin book launch will take place on 6 February 2019 in Berlin (19h00) at the Denkerei, ORANIENPLATZ 2, where Wolfgang Kaleck will discuss – with Nadja Vancauwenberghe, publisher and editor in chief of Exberliner – today’s challenges and opportunities in the struggle for human rights. Syrian musician Abdahllah Rahhal is an international artists whose work aims to highlight humanity in every moment of life.. The event will be held in English and can be followed via livestream. The European Centre for Constitutional and Human Rights, ECCHR, uses the emancipatory potential of law in order to unmask unjust power relations and enforce social justice. Its goal is to change or re-create legal norms in the spirit of global justice. As part of its 10-year anniversary it created a new ECCHR department: the Institute for Legal Intervention. The Institute will complement ECCHR’s litigation and will encompass the Education Program, professional exchanges in transnational networks, cooperation with universities and dialogue with artists as well as cultural and social movements. The aim of the Institute is to initiate important legal debates, to foster young human rights lawyers and to deepen collaboration between disciplines. All this thanks to the generous support of the Bertha Foundation. The Video clip above gives the details. The issue of impunity is pertinent to the protection of human rights defenders. For that reason I refer to an interesting development that follows the disclosures on torture and abduction by the CIA in the courageous Senate report. If only more countries were willing to investigate so publicly their own records (China, Russia?). Former NSA contractor turned whistleblower Edward Snowden was given the Carl von Ossietzky Medal in Berlin on Sunday, a medal which honors those who exhibit extraordinary civic courage or commitment to the spread and defense of human rights. According to website of the International League for Human Rights in Berlin, which has awarded the prize since 1962, Snowden was chosen because of his “momentous decision of conscience … to put [his] personal freedom on the line” to expose the “abuse of power” exercised by the US and Germany. The von Ossietzky medal is named after the German Nobel Peace Prize winner who spoke out actively against the Nazi regime. Not to be confused with two other awards in the name of Ossietzky. 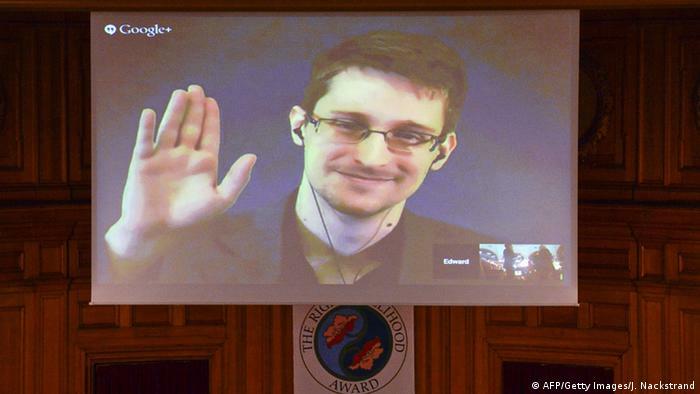 Edward Snowden gets human rights award in Berlin | News | DW.DE | 14.12.2014.